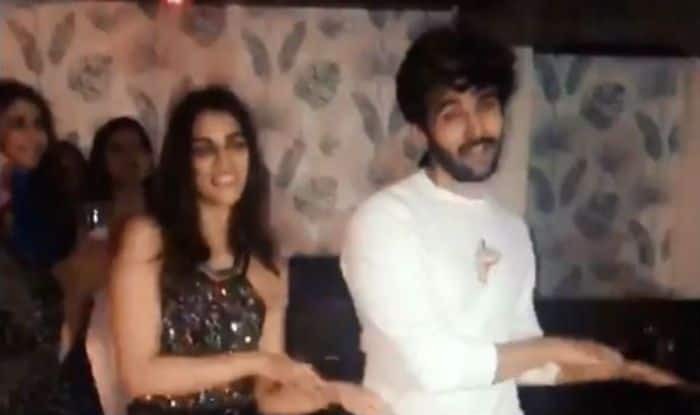 Kriti Sanon and Kartik Aaryan’s upcoming film Luka Chuppi’s first song ‘Poster Lagwa do’ has released a few hours ago. But before the release of the song, both the stars partied together on January 28 and grooved to their new song. In the video shared by Kriti, both are seen trying to remember the hook steps from the song and guess what they have a hard time remembering the steps. Well, the video is hilarious and will leave you in splits. Talking about their look, while Kriti looked mesmerising in a shimmery top and short black skirt, Kartik chose to wear a white tee and black denim. The video is now going viral on social media and has already received more than two lakh views. Their fans have been pouring their comments and best wishes for the film. Talking about the song ‘Poster Lagwa do’, it is the recreated version of the track from Akshay Kumar and Urmila Matondkar’s film Aflatoon. They have showcased their phenomenon dance moves and their chemistry is hard to miss. Kriti and Kartik have come together for the first time and it seems like they are set to give a blockbuster film. The trailer of Luka Chuppi released recently and it got a positive response from the cinema lovers. The movie revolves around a couple who decides to get into a live-in relationship before talking wedding vows and later, their family gets involved.